Rotary Watches	There are 12 products. 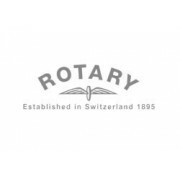 Authorised Rotary watch stockists in the UK. Rotary ladies & mens' watches available at Macintyres of Edinburgh. Further selection available in-store so please contact us if you can't find what you are looking for. Free UK delivery on orders of £50 or more. Members save up to 30% off RRP. Gents classic stainless steel bracelet watch with quartz movement and white dial with date window set beneath mineral glass. - Silver Tone Case and Bracelet - Quartz Movement - White Dial - Mineral Glass - Hour Markers - Day/Date Function - Waterproof - Complete with Rotary Presentation Box and Life Time Guarantee. Rotary Editions watch. - Automatic movement - Oversized case watch - Black Dial - Rose gold plated stainless steel case - Brown Leather Strap - Screw down crown - 100m water resistant - 2 Year Manufacturer&apos;s Guarantee - Presentation Watch Box. Rotary gents Editions watch. - Automatic movement - Black Dial - Date feature - Titanium plated stainless steel case & bracelet - Screw down crown - 100m water resistant - 2 Year Manufacturer&apos;s Guarantee - Presentation Watch Box. Rotary Editions watch. - Automatic movement - Oversized case watch - Black Dial - Rose gold plated stainless steel case - Black rubber strap - Screw down crown - 100m water resistant - 2 Year Manufacturer&apos;s Guarantee - Presentation Watch Box. Rotary Editions watch. - medium size - Automatic movement - Steel case with titanium plating - Luminous hands - See through dial - Dolphin Water Resistant - Mineral glass - Screw down crown - Rotary Presentation Box - Lifetime Rotary Guarantee. Rotary Editions watch. - Automatic movement - Oversized case watch - Black Dial - Titanium plated stainless steel case - Black rubber strap - Screw down crown - 100m water resistant - 2 Year Manufacturer&apos;s Guarantee - Presentation Watch Box. Gents Rotary 9ct yellow gold bracelet watch. - Quartz analogue movement - Cream dial with 9ct batons and hands - 9ct bracelet and case - Mineral glass - 30m water resistant - Rotary box - Rotary 2 year manufacturers guarantee.